Iconic paintings by Tom Roberts, Arthur Streeton, Charles Conder and John Russell will feature in Australia’s Impressionists , the first exhibition on Australian Impressionism in the UK and the first Australian exhibition at the National Gallery, London. Works travelling to London are drawn from the collections of some of Australia’s leading public galleries as well as private collections from Australia and the UK. 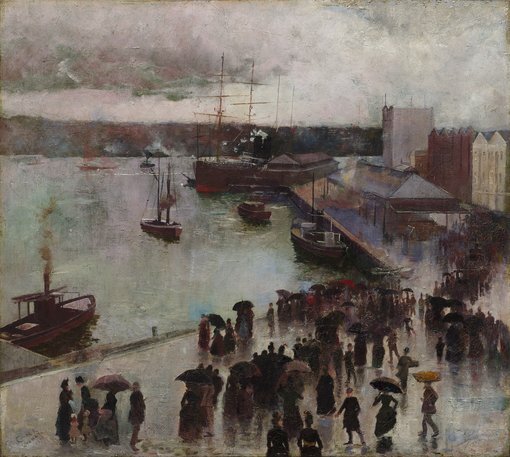 The Art Gallery of New South Wales has collaborated with the National Gallery on Australia’s Impressionists and is lending 13 of the 41 works for the exhibition including Conder’s Departure of the Orient – Circular Quay , Streeton’s Fire’s on , Roberts’s Holiday sketch at Coogee and Russell’s Madame Sisley on the banks of the Loing at Moret . The exhibition explores the impact of European Impressionism on Australian art in the 1880s and 1890s, and traces how the art which emerged both referenced the work of European artists and yet was distinct from it. The Australians painted en plein air (outside in front of their subjects), responding to the specific places they painted, whether they were city streets, rural landscapes or harbour scenes. Preoccupied with local conditions of light and atmosphere, they developed bold and experimental techniques to depict scenes of daily life. They also developed their art within the cultural and political context of a growing sense of national identity in the years leading up to Federation in 1901. All of the artists featured in the exhibition either studied or worked in Europe at different stages of their careers and were inspired by the paintings they encountered by artists such as Monet and Whistler. Impressionism became an international art movement in the late 19th century, with local variants arising in many countries simultaneously and this exhibition explores both the internationalism of the Australian artists as well as what was unique about their art. Streeton’s Fire’s on is one of the highlight works of the exhibition. Showing the construction of the Lapstone railway tunnel through the Blue Mountains, it vividly depicts the moments after a young navvy was killed by a blast not far from Streeton. The portrayal of resilience in a sometimes harsh environment became a recurrent theme in Australian art in this period. This painting is also one of the great depictions of Australian summer heat and glaring light and yet shows in its vertical composition and high horizon line the influence of Japanese art that was also greatly influential on the European Impressionists. In this way it is also located within a global matrix of references. Art Gallery of New South Wales director Dr Michael Brand said the Gallery was delighted to collaborate with the National Gallery, London on Australia’s Impressionists . “The Art Gallery of New South Wales is committed to exploring Australian art in an international context so we are delighted to collaborate with the National Gallery to realise this important exhibition. “The focussed consideration of these artists at the National Gallery, London where an exceptional collection of works by their international peers such as Monet are also exhibited, will enrich our understanding of their practice and the importance of Impressionism as a truly international art movement in the late 19th century,” Dr Brand said. Wayne Tunnicliffe, Art Gallery of New South Wales head curator of Australian art, curatorial advisor and contributor to the Australia’s Impressionists exhibition publication said, “The Art Gallery of New South Wales has one of the finest collections of Australian Impressionist paintings, unique in that many were purchased from the artists’ studios when they were aged only in their twenties – the emerging artists of their day. “All four painters who feature in this exhibition were ambitious and international in outlook and I am delighted that now they will exhibit at the National Gallery in London, surely something about which all four would have been immensely proud,” Tunnicliffe added. Australia’s Impressionists was inspired by the long-term loan to the National Gallery in 2015 of Blue Pacific (1890, private collection) by Arthur Streeton. This was the first painting by an Australian artist to be displayed at the National Gallery. The exhibition will further introduce visitors to the artistic movement to which it belongs. Wayne Tunnicliffe, Art Gallery of New South Wales head curator of Australian art, will present a lecture on the Impressionist works of John Russell at the National Gallery, London on Monday 12 December 2016. Australia’s Impressionists is organised by the National Gallery, London in collaboration with Art Gallery of New South Wales. The exhibition will be on view at the National Gallery, London from 7 December 2016 to 26 March 2017. For further information or images, or to arrange an interview with Dr Michael Brand or Wayne Tunnicliffe, please contact Simone Bird, communications manager, Art Gallery of New South Wales via simone.bird@ag.nsw.gov.au or via +61 2 9225 1674 /+61 (0) 498 002 321.